The tables and nomographs produce good estimates of head fire behavior. This nomograph uses effective windspeed to produce adjustment factors for both spread rate and flame length that can be applied to the head fire behavior outputs. Begin with the EWS at the base of the right-hand chart, draw a vertical line to intersect desired spread direction and the axis at the top to read the length to breadth ratio. Draw a horizontal line from the intersection at desired spread direction into and across the left-hand chart to intersect the left axis. Read the fraction from the left axis and apply it to the headfire ROS to obtain the spread rate in the assumed direction. Draw a vertical line down from where the horizontal line intersected curve in the left-hand chart to the bottom axis. 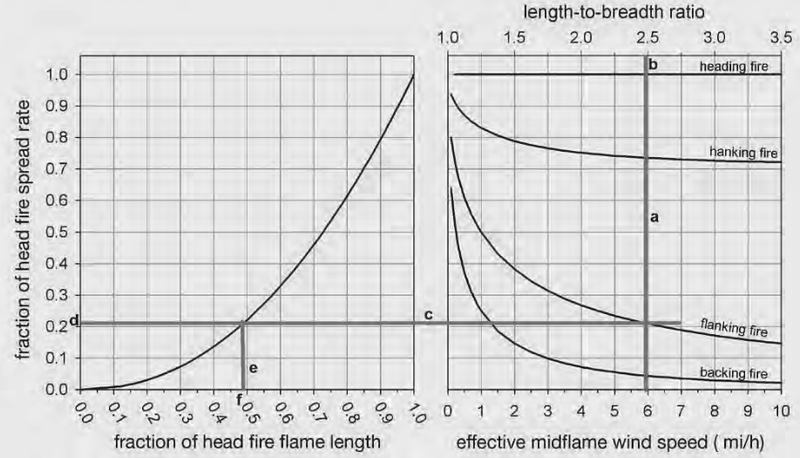 Read the fraction from this bottom axis and apply it to the headfire flame length estimate to obtain the flame length in the spread direction assumed.